Stories are the stuff of life, how we understand ourselves and others. We all tell them whether by a child's bed at night or in the pub at the weekend. Didn't you find faces in clouds or the knot holes in wooden doors or weave stories around the patterns in a carpet? My childhood canvas was the curtain in my bedroom. There were colourful swains and dairymaids strolling through a wooded grove along a lane which flowed down into a repeat of the pattern with more youths and milkmaids below. I loved that scene, building fantasies around the country folk - who they were, who loved whom, where they were going - as I fell asleep. How I, and probably you, would all have envied any child who grew up in the Casa de Sezim had we known it existed. The pink and grey manor house stands on a hillside just outside the city of Guimarães in northern Portugal. A monumental gate with the family coat of arms leads into a gravelled courtyard. To the left are a chapel and the estate offices, to right the old stables and storerooms converted into accommodation for guests and ahead the staterooms where fantasy holds sway. In a royal castle the walls would have been hung with Gobelin tapestries, but of course kings have deep pockets and ways of refilling their treasuries. They can borrow from their courtiers in return for favours. 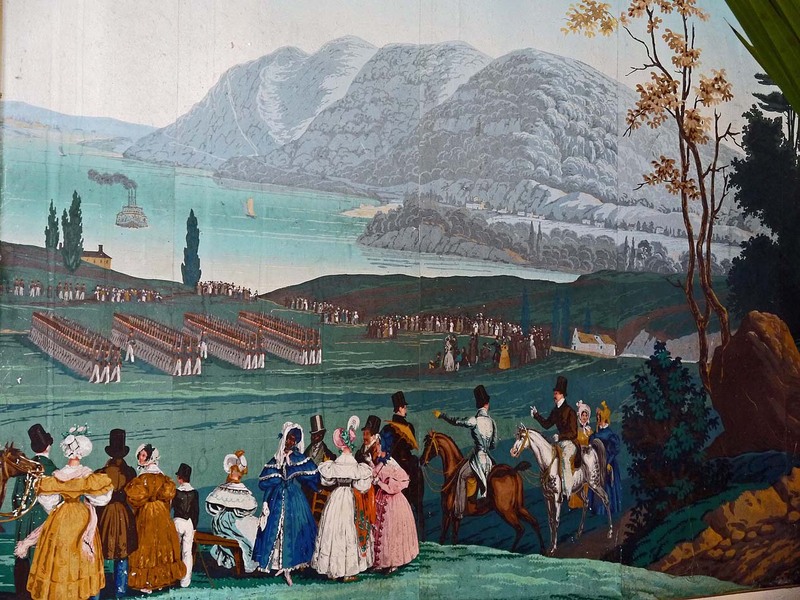 The aristocracy and gentry of Europe had to choose less expensive but equally exotic wall coverings. 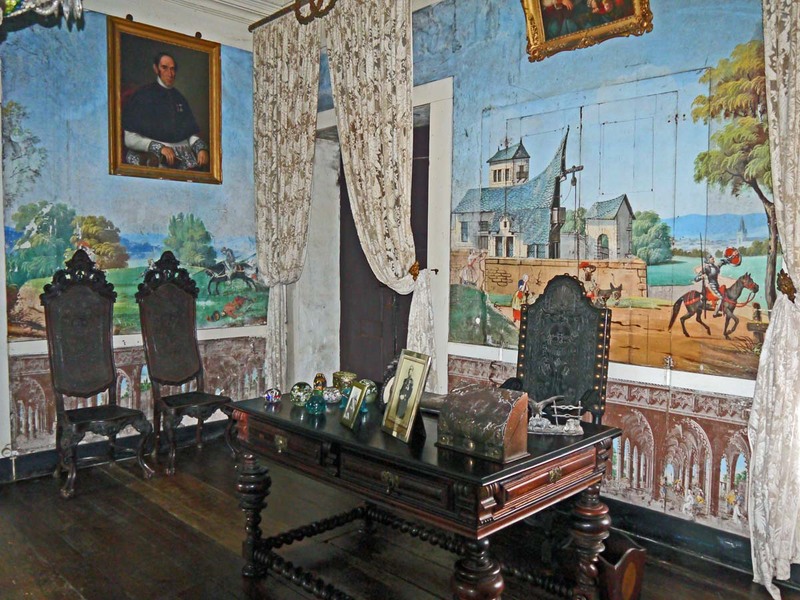 In the Casa de Sezim, between 1795 and 1865, they hung French wall papers in their reception rooms. Come with me through the gate into the courtyard and check into one of the comfy bedrooms in the converted stable block. Then, when you have settled in, we'll go and visit the rest of the house where the walls take us into the worlds of exotic overseas lands, history, myth and imagination. Let's look first at the papers depicting North America . 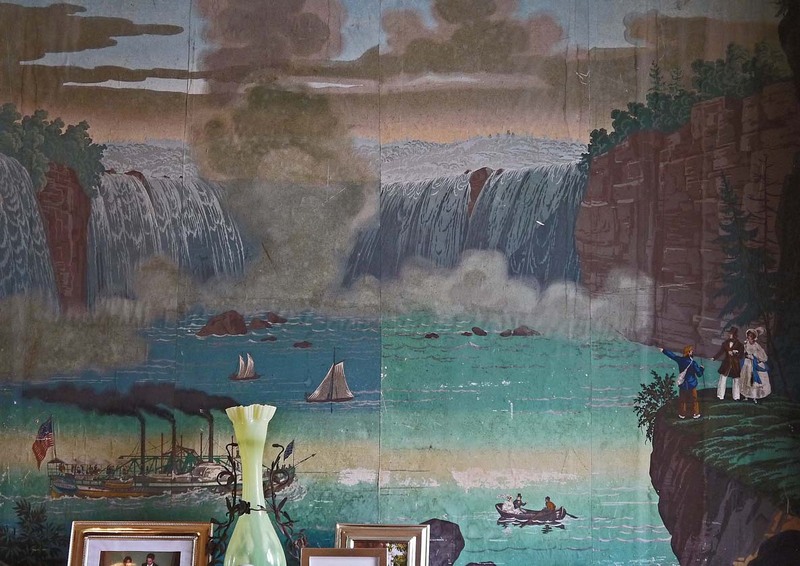 The artist who painted this wallpaper of the thundering Niagara Falls with its billowing clouds of spray had never visited the US. He painted from pictures in his workshop in Alsace, leaving him free to re-imagine a colourful scene. He placed a well-dressed couple on a rocky outcrop above the lake with a guide who, blissfully unaware of health and safety considerations, chooses to stand so dangerously near the edge of the vantage point that one false step would send him plunging to his death. On the lake itself a husband and wife, all dolled up in their Sunday best, are being sculled across at a safe distance from the cascading waters and a party of visitors is taking a round trip on a wonderful four chimney steamer. What magical stories this picture conjures up! Below a tourist party on an outing to the mountains takes a ride on a horse drawn carriage which runs on rails. Curiously, considering the period, there seems to be little racial segregation in this painting. Where is the carriage going? Who are the people grouped as though at a fashionable garden party? Here on another wall is parade of trainee soldiers drilling at West Point, the Sandhurst of the United States, though we might almost imagine ourselves at the muster before the battle of Austerlitz, looking on with Pierre Bezukhov of Tolsoy's War and Peace. What do you think this picture, with tall ships at anchor in port and goods in sacks on the docks, might be? What sea-faring adventures does this depict? 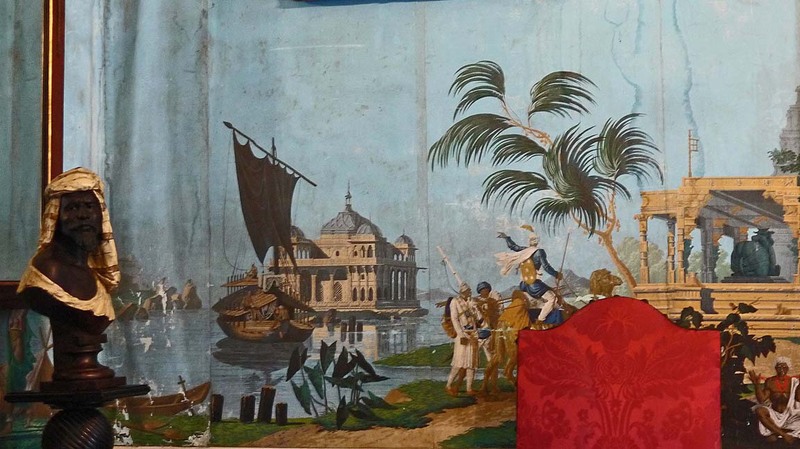 In fact, it seems that this wall paper may show us the scene before the most famous struggle of a people against unfair trade and taxation. This, according to the owner of the Casa de Sezim, is the Boston Tea Party when Americans threw a valuable cargo of tea into the waters of Boston Harbour in protest at King George III's punitive taxes and their own lack of representation in parliament. Let's walk through into another room. Here we have been transported to India. Now we can weave our stories around onion-domed mosques with slender minarets, tiered Hindu temples, pleasure pavilions and exotic gardens all under tropical blue skies. 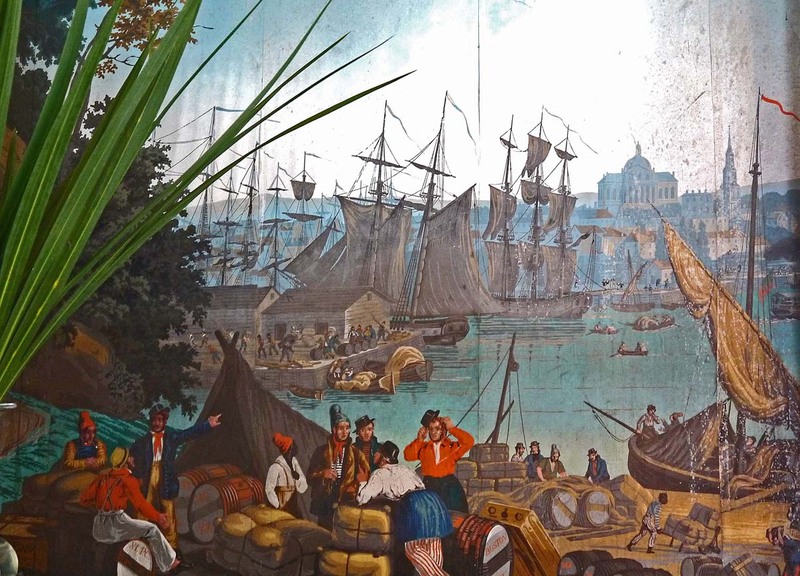 Portugal, of course, was the seafaring nation which, under the captaincy of Vasco da Gama, first rounded the Cape of Good Hope and found a sea route to India, the orient and the homes of silks and spices. Maybe this raja's palace in the middle of a lake could be your dream dwelling? Imagine pleasure trips with picnics in the barge or riding on a camel to pay your neighbours a social visit? Or shall we wander still further into a study? Let's imagine ourselves as children playing at our father's feet as he works at his desk, perhaps checking his estate accounts or writing business letters. 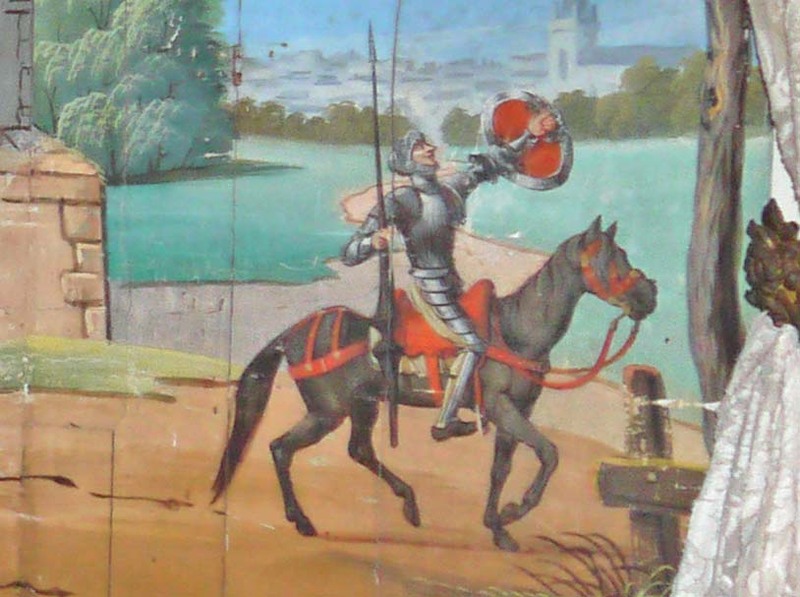 As children we might not know that the armour-clad knight at arms is Don Quijote. So while our father managed his estate we could also imagine this to be a knight errant leaving home to seek out dragons and release beautiful captured maidens. Would the fantasy matter? Of course not. After all Don Quijote is imagined, the product of Cervantes fertile mind. Let's dream up a reason for the lady in the corner, pleading with someone in the house. Perhaps she's calling on the lord of the manor to prevent her knightly lover from going to war. What of the weeping maid? Has she been dismissed? Or was she dishonoured by a faithless knight who is now insouciantly leaving upon some chivalrous quest? 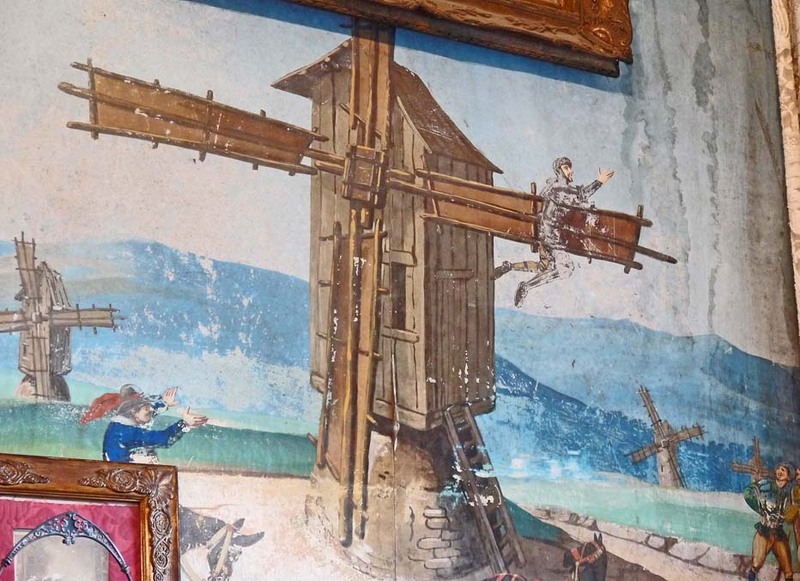 But then once his ledgers have been closed for the day, perhaps our father would tell us of Don Quijote who tilted at the windmills of his native Spain, imagining them to be a phalanx of giants. 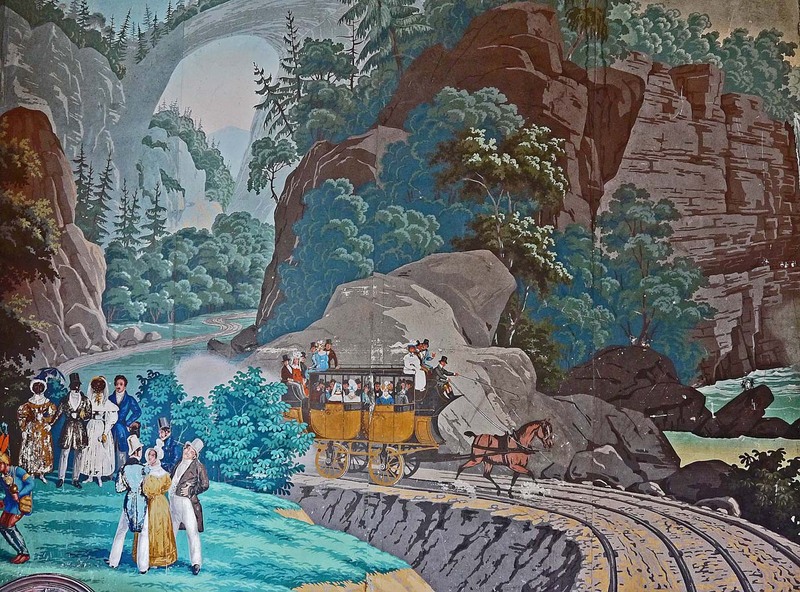 So who painted these fascinating wallpapers? I'm not sure who is the author of which paper but much of the work seems to have been done by a man called Auguste Roquemont, described as a Portuguese painter of the romantic period. However, he seems to have had a curious lineage for a Portuguese person as he was born in Genoa in 1804, appears to have a French name, despite being described as the son of Prince Auguste of Hesse, to have studied in Italy, lived in Paris and Germany and finally moved to Guimarães and Porto, where he died in 1852. 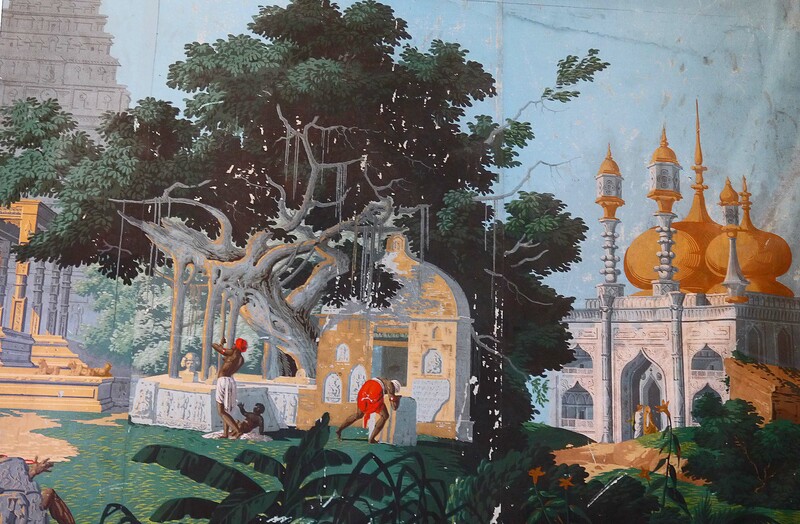 Clearly Auguste Roquement was a traveller not only in his head and through his paint brush but also in real life. Others designers mentioned are P.A. 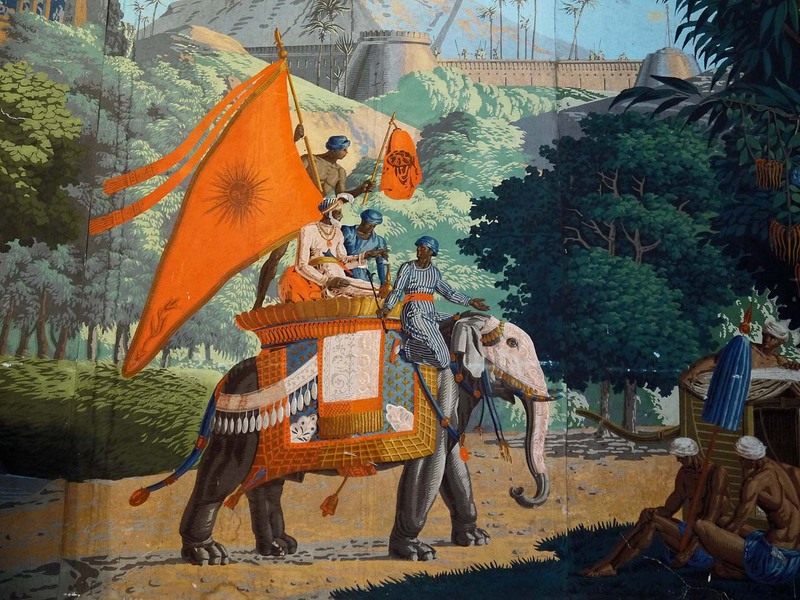 Mongin who used a work by William and Thomas Daniell called Oriental Scenes, Twenty-four views in Hindustan as inspiration and J Zuber of Rixheim in Alsace who designed the scenes from Don Quijote, The wallpapers themselves seem to have come from workshops in Paris. 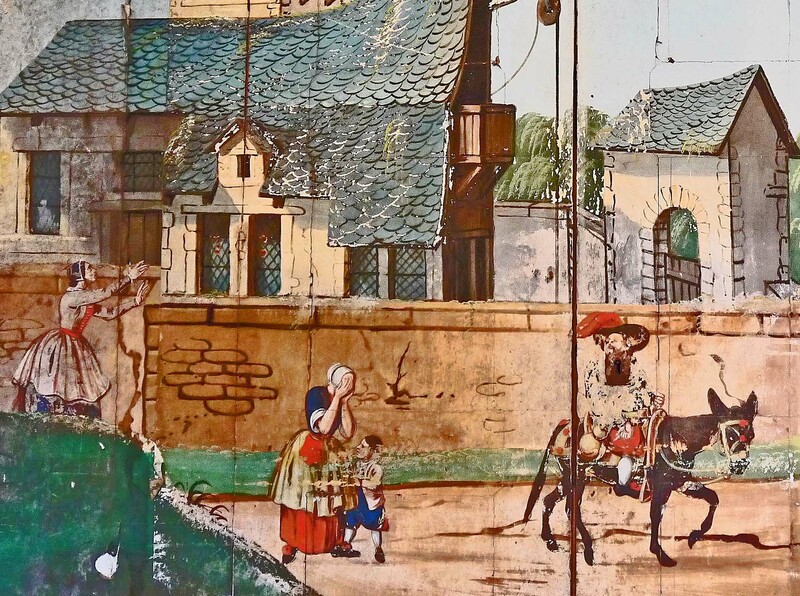 There are other examples of exotic French wall papers in France itself, as well as in Sweden, Italy and Spain. Though there are occasional small pieces elsewhere in Portugal, The Casa de Sezim is the only building with a large collection of wall papers almost intact in Portugal. The owners of the house, who can trace their ownership back several hundred years, still have a letter in their archives recording their purchase. One thing that is noticeable about these rare works, however, is their condition. They are clearly in need to expert conservation. Running into hundreds of thousands of euros, this is something almost certainly beyond the means of individuals today but in the present economic situation, help will not be forthcoming from the state. 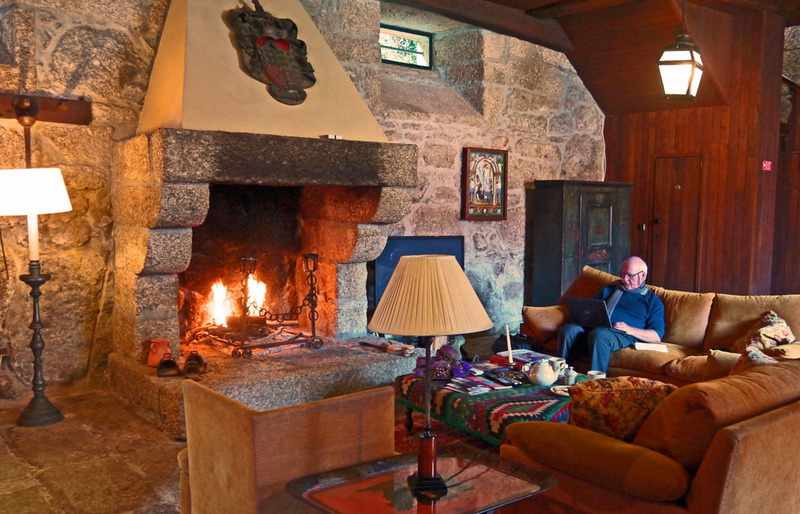 Yet it is clear that the present owner of the Casa de Sezim is the guardian of a piece of important Portuguese heritage. He is trying to create a family trust to preserve the paintings and hoping that such a charitable organisation might merit financial help for the EU. 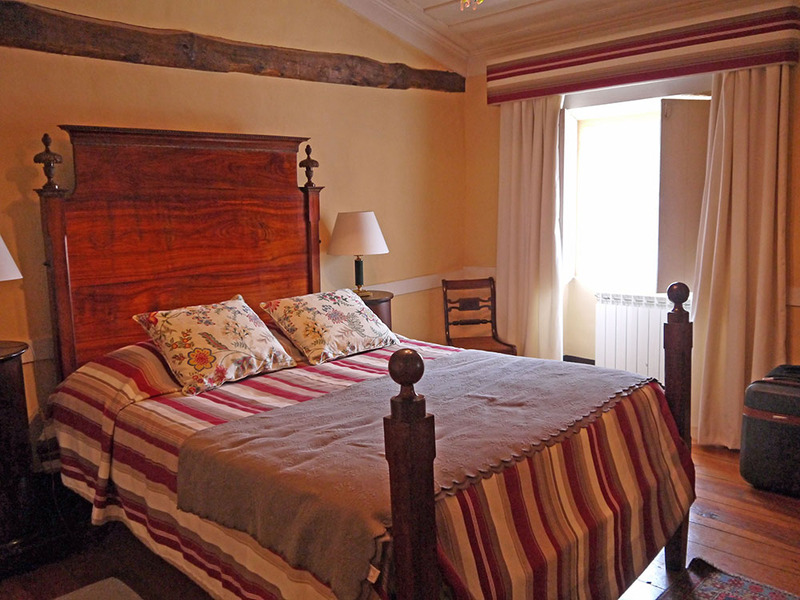 Staying in such manor houses as guests helps with the upkeep of the property as well as being a delight for the visitor who, after a busy day's sight-seeing can relax in the guests' sitting room in front of a roaring fire. Perhaps you would like to visit too. If so, contact the Casa de Sezim itself, or alternatively Solares de Portugal or Turismo de Habitacao to make a booking. Do you have any favourite places with unusual stories or artefacts? Please let us know if you do.